Hooray for TGIF! I can’t believe I never used “TGIF” as a title before now! 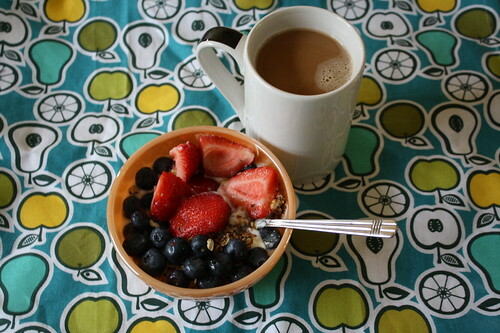 Breakfast was Stonyfield French Vanilla yogurt with strawberries and blueberries. Never seems to get old. 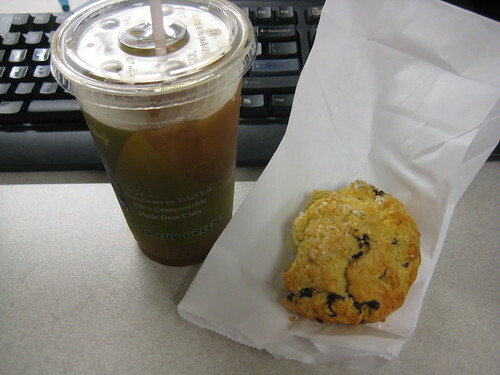 Snack at work was an iced coffee and chocolate chip scone. I treated myself because it was Friday and because my belly was hungry. 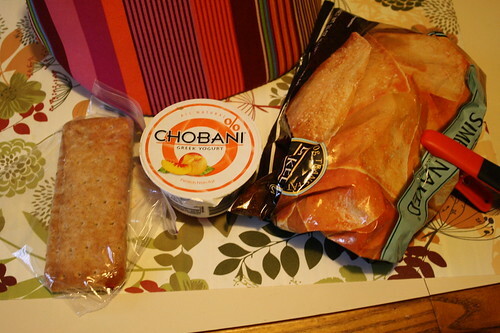 Lunch was a ham sandwich with spinach on whole wheat and a mango Chobani yogurt. 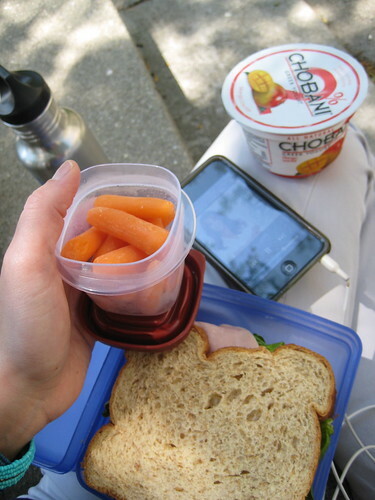 I ate outside and listened to Jillian Michaels’ podcast, which was excellent! 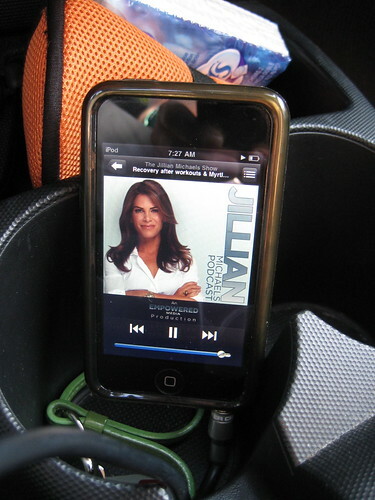 Obviously from this picture, you can see I also listened to it on the way to work this morning! I loved the topics she got into and I found the information really useful. I actually may listen to the beginning of the podcast again and take notes. Thanks for the suggestion to download this podcast Denise! Unfortunately, I kept getting interrupted while eating and listening to my iPod. I had to tell a guy to leave me alone and back off. Everyone was asking me for money (three separate people did). After work, I napped on the couch. It was glorious! Craig and I went for a walk around the neighborhood too. Dinner was just Stacy’s pita chips and an electrolyte drink. I didn’t think my stomach could handle anything else. We’re watching The Social Network for the second time tonight. I liked the movie the first time and it’s fun to re-watch it. I was able to sleep in a little bit this morning and it felt good. The key was to feed the cats their breakfast and then head back to bed. I had thought about going to yoga, but then our driveway was covered in snow and I didn’t feel like shoveling. I was hungry when I woke up so I made myself a big breakfast. 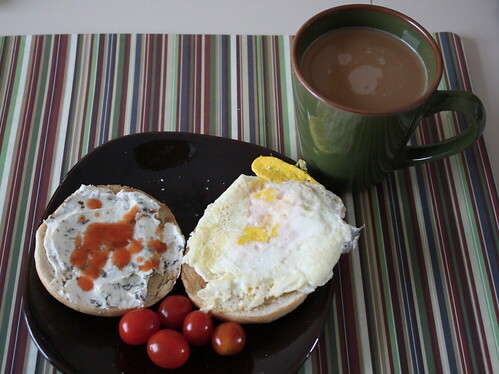 Fried egg on a plain bagel with Philadelphia Spinach & Artichoke cream cheese & a bit of Frank’s Red Hot. I had a few grape tomatoes too. The addition of the cream cheese was a smart choice. I wasn’t sure how it would all blend together, but I loved it. I cleaned around the house, did more laundry and then just relaxed by getting stuff done online. I read some of the Larsson book and a magazine. All of that reading made me sleepy and I ended up falling asleep on the couch for almost an hour! Oh well. That’s what Saturdays with no formal plans are for I guess. When I woke up, I made up for the nap by reading 75 pages or so of my book and cleaned some more. 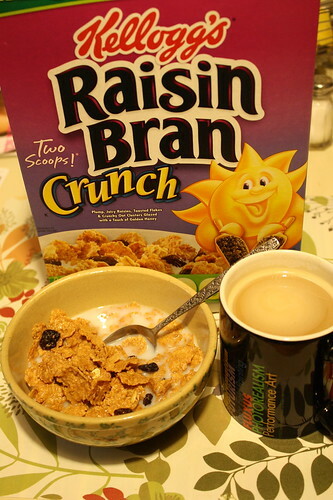 I slept through lunch, but my breakfast filled me up, so I wasn’t hungry until about 2. 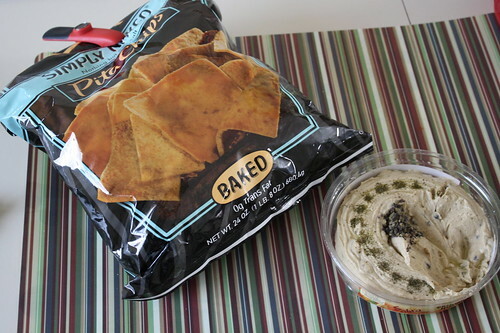 I also snacked on some Stacy’s pita chips with Sabra greek olive hummus. Love that flavor! It’s so good. 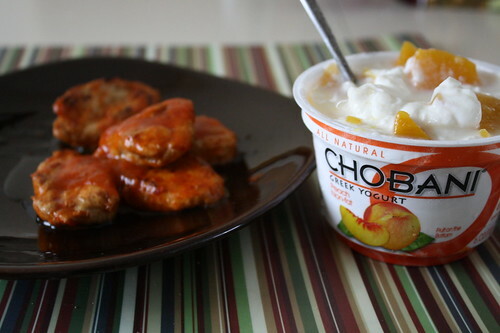 For lunch, I made the last of the gardein buffalo wings and had a peach Chobani with canned peaches on top. Craig and I finally left the house and decided to go to Half Price Books and then to Red Robin for dinner. I knew I wouldn’t eat a burger, so I scoped out the menu ahead of time for some healthier choices. That is pretty typical behavior from me before going to a restaurant though. I was disappointed they didn’t have their nutritional information posted on their site. At Half Price Books, I was on the hunt for The Omnivore’s Dilemma by Pollan, but they didn’t have it. I want to get it to read during our upcoming trip to Florida. I guess I’ll have to order it from Amazon instead. 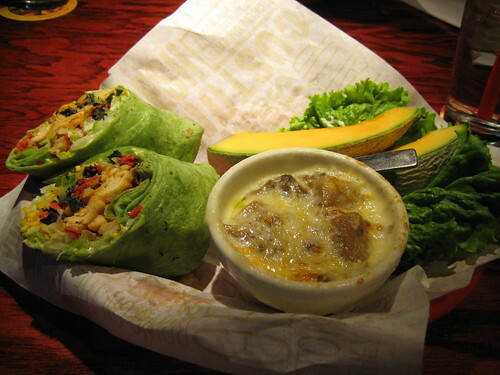 At Red Robin, I chose a BBQ chicken wrap and a cup of French Onion Soup. It was cold out so I was in the mood for soup. I am not normally a big soup person, but I love French Onion. The wrap was really good. 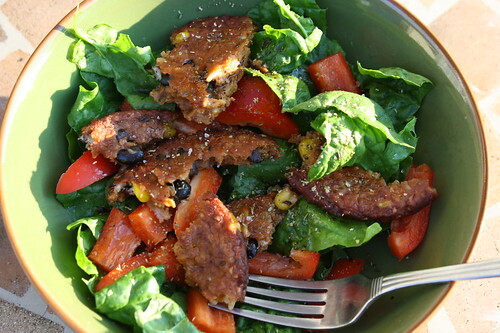 It had tortilla chips in it, which was a nice addition, and a great flavor overall. 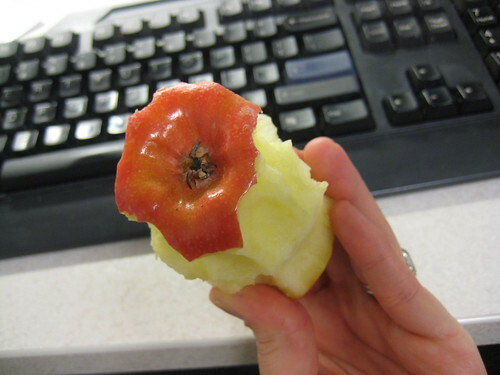 I only ate half, because then I have a wrap to look forward to for lunch tomorrow. The Packers are in the playoffs, so we’re watching the game now. We actually don’t watch football normally, so we didn’t even know if the game was on today or tomorrow. 🙂 Hence my title. Go Pack Go, love your biggest fair weather fans.